Plogue Chipsounds works great with its presets. But that wave table can really throw you off if you’re new to the tool. This should will help you learn how to use it to create classic sounds and also show you some great examples along the way. Sync – This determines if the steps that happen in your wave table are in time with your MIDI tempo or the tempo specified in the BPM. BPM – Set’s the internal BPM of the controller. It can be overridden by clicking Sync. 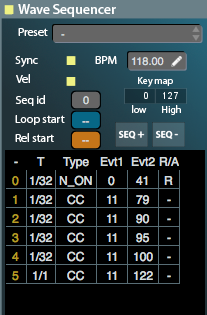 Vel – Check this if you want the notes playing to respond to the velocity (how hard you hit it) of your keyboard or midi notes. If you uncheck this, notes play at full volume. Usually you want to uncheck this for realistic NES sounds. Loop start – Once the entire wave table plays through, this tells it where to start looping (if at all). Rel Start – If you don’t want to start at the first command the first time through, put the step value in here that you wish to start on. We will cover Sequence settings in a future tutorial. Let’s start by looking at what each feature is for and the options under each one. T – The T column is for tempo. This controls the length of each sequence of commands and notes that you play. For example, if you make two wave table items with T = ¼, when you play the note, the commands will execute starting from when the midi event (or keyboard hit) is detected and then the second command will kick of ¼ of a note later. Check the Sync checkbox to have it get it’s tempo from the MIDI environment (aka your song’s tempo). You can also put T=0 which means you want to change something about the upcoming note but not actually have it count time for this command. We’ll see how this works in the examples later on. Null – Nothing happens, use this to leave a gap or a delay of a certain time before the next command executes. CC – Control Channel – You use this to change things like the vibrato, expression (volume level), filter cutoff ect. NoteOn / NoteOff – These do what you’d think, they tell the note to play or not to play. You can use this to make gaps, echoes and arpeggios. 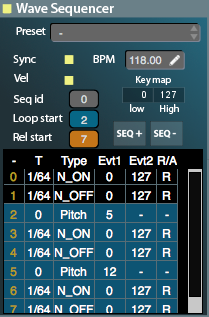 Pitch – This will take the note up or down the amount you specify in the Evt1 column. It is used for making arpeggios. KS – Keyswitch controls which of the channels of the default chip you are using, you use this to change from pulse1 to pulse2 to triangle, to noise. This can create some interesting effects that would be hard to do in a real tracker but not impossible for the chip to play. 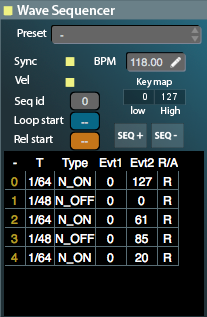 Evt1 Column – The settings here depend on the type you’ve selected. For CC it’s the selection of the note property you wish to change. It will give you a drop-down of valid choices based on your type. For pitch, it is the amount of up or down steps you wish to go. 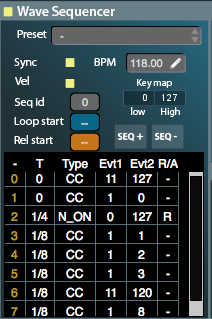 Evt2 Column – This column is usually the value of the change For example, if you select Type CC and Evt1 = 1 (which is Pitch LFO Depth aka Vibrato) Evt2 tells the system how much vibrato you want to be added to the note at this point. Some examples will explain it best. We will explain what happens at each step in the process. 0 – The note plays for 1/64 of a whole note. 1 – The note is turned off for 1/48th of a whole note. 3 – The note it turned off again. The 64th and 48th notes give it the offbeat echo effect that we commonly hear in music. 0 – The note is turned on and plays for 1/64th. 1 – The note is muted for 1/64th. 2 – The pitch is stepped up 5 half-steps. Since T=0, this is done before the next note plays. 3 – The next 5 half-step higher note plays for 1/64th. 4 – The note is turned off for 1/64th. 6 – The note is played an octave above the original for 1/64th. 7 – the note is muted again. Loop start = 2 – the sequence goes back to step 2 until the user lets go of the keyboard or the MIDI note ends. 1 – The vibrato (CC=1) is set to 0. No time has passed, nor has a note played. 2 – The note begins to play for ¼, each time a key is pressed, steps 0 and 1 execute with no time pass before this step. 3,4,5 – After 1/8 the vibrato (CC=11) is increased slightly. 6 – The volume (CC=11) is decreased slightly. 7 – The vibrato reaches its maximum of 8 here. Make sense? It’s really about setting up a series of steps that happen in a finite space of time. Do it right and you can really get some sweet sounds of out this unit. Growing up I never had a Sega Genesis. We always had Nintendo products. I think it mostly had to do with the family friendly image Nintendo produced compared to Sega’s more edgy arcade style marketing. A while back we looked at some of the chiptune artists using the Genesis over at videogamedj.com, check out the post here. But for actual game music, here’s some great Sega Genesis soundtracks you probably never heard of. Making rock music in FM synthesis is not easy. Things are either too distorted or not enough. This game gets it right. You know those are guitars rocking out as soon as the notes hit. The game itself is sort of like a space shooter meets Contra with anime themes tossed in. The soundtrack is a blistering onslaught of guitar and drums hat doesn’t let up for a second! The game that started the real time strategy genre sports a very good soundtrack as well. Lots of variety and some excellent fm synth tones that would sound great even in a modern electro album. The slow tunes especially stand out (Be His Soul Rest). I must admit I never played this game. Love the 80s sounding bass and smooth tones on this soundtrack. It never gets hissy or squealy. It really sounds like an NES Soundtrack just for the drums and composition style. The original Genesis Batman has some of my favorite Genesis music. It reminds me a lot if Journey to Sillius and later MegaMan X. The Axis Chemical plant stage is up there in my top tracks of all time. Love the intros the stage tracks have. You only heard of this game thanks to All Your Base, but it happens to have some of the most killer rock music on the Genesis. It’s really hard to mimic the crunch of a palm muted distorted guitar using synthesizer. But Zero Wing does it perfectly. They also do the harmonizing guitar solos that are the staple on 80s rock and Dragonforce type groups. Next week we will look at how to get these soundtracks into your mp3 player without downloading one track at a time. I have really fond memories of the Sega Genesis system, which is strange because we were a humble, middle-class one-console (SNES) family and I only played it at the neighbor kid’s house. Lately, I’ve been wanting to explore the possibilities of composing chiptunes with the Sega Genesis’ Yamaha YM2612 FM chip. If you don’t want to read my rants, skip to the bottom for a quick list of what you need to downloaded to get started. Genesis certainly was the coolest looking console of the era. I thought I’d share my journey since it’s been a long and somewhat frustrating one. Right off the bat, I’ll tell you there are tons of options, the Sega Genesis and Master System use FM Synthesis, which tons of synthesizers support. You could technically create the same sounds with some of FL Studio and Logic’s native synthesizers, but it might not sound exactly like the Genesis itself. The Genesis could also play samples. This is how most games did their drums. The super crunchy bitsmashed little samples are kind of what defined the sound of the 16-bit Sega era in my mind. For now, I haven’t investigated native trackers – the Genesis equivalent to LSDJ might be out there somewhere but I don’t even have a console, so for now, this article is about how to get started quickly and with some degree of realism within a DAWS like FL studio, Logic Pro or Cubase LE. It’s a long road to getting truly authentic, but I thought I could at least help people get started. My goal was to be able to compose in MIDI, not learn another tracker program. If you want to do that, you’ll want to get TFM Music Maker. It’s actually pretty easy and similar to LSDJ and Famitracker, but I just wanted to compose in a familiar environment and end up with everything in my DAWS at the end. You’ll see my “Battle Zone Alpha” song up top, which I made with a combination of three tools. VOPM – This is a pretty simple VST that emulates the Genesis’ Yamaha FM chip. You can build your own instruments by fiddling knobs, but if you’re not familiar with FM synthesis, it can be time consuming and difficult. Here’s a tutorial if you want to try it from scratch. One thing that I wanted to do right away was pull instruments from existing songs I knew on games I liked, sounds from Sonic and Earthworm Jim came to mind. There are two ways to get these loaded into VOPM. Using the Gens KM Mod and a Neo Geo tracker called MVSTracker MD, you can dump a Yamaha channel from a running ROM and then load it up into MVSTracker, which has the same exact values and settings as the VOPM VST, then you just put the two side by side and set the VOPM VST settings to match the instrument you pulled from the game. This thread explains how to do it. Fortunately, some wonderfully generous person took the time to pull all the instrument settings from almost any game you can imagine and put them into a format that VOPM can import. This can save you some serious time! VOPM runs great in Cubase LE and FL Studio and I’d imagine it’ll work anywhere else you can load a VSTi. This is how I get my bass, pad and lead sounds. It’s not quite as perfect as I’d like, and I still haven’t dipped into automation, note bends and other things, but I imagine that can all be done through MIDI commands with VOPM. I kind of feel like sampling things is cheating, but this is the quickest way to get some Sega Genesis sounding drums going within your DAWS. Just load these samples up into the sampler of your choice and you can get that classic drum sound. There are also tons of vocal samples, orchestral sounds, rock guitar bits and other things that you can use to get that classic sound. One thing you’ll notice right away is that VOPM outputs at rather low volume levels. I bounced each track to a WAV and then loaded them all up into the DAWS and do a little EQ’ing and leveling before proceeding with normal mastering steps. Anyways, you may not be the 16-bit master by the end of this, but you can get some classic sounds without learning a new tracker from scratch. Have fun! VOPM 2612 Org’s Game Instrument Bank – If you want a bass line from a certain sonic level, you can import it from here into VOPM. Mixer P and Friends Sega Genesis Drum Samples – Load these into the DAWS Sampler VST of your choice and use your MIDI drum patterns.